Walmart is basically giving away our favourite budget 4K TV for gaming right now. 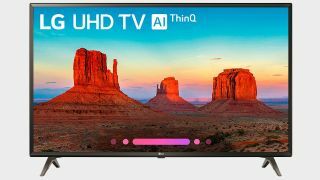 For only $270, you can get a full 4K and HDR experience in your lives with this 43-inch LG television. It looks like its the cheapest its ever been - the cheapest Amazon have ever sold it is a fraction under 300 dollars in December last year. It's got a great panel that embraces all that 's good about LG's picture quality reputation and pedigree as well as everything else that 4K displays offer: 60Hz for good console play; and HDR10 to provide you with genuinely impressive colours for its LED panel. What's great about this LG set is that the viewing angles are superb too, so you don't need to be sat right in front of the set. This does represent serious value so its well worth a look - even for your home's second TV or gaming room display. Elsewhere this telly box has Google Assistant built in, so it can be voice controlled, while its own menu systems are excellently easy to use. It has a special feature based around in-plane switching, which means you get vibrant colors even if you're viewing the screen from an angle - great when you sharing the screen for local multiplayer. Lastly, you can have confidence in both the connectivity and the audio of this TV with plenty of ports and perfectly serviceable speakers (until you can upgrade the latter with a headset or sound system).